Hi folks, how are all of you doing? You see this photo I took when I was out at the shops a couple of months ago with my daughter? How cool. 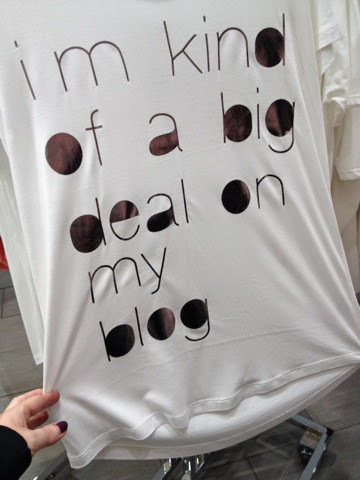 Just shows how far blogging has come these days. Using blogger as a platform is a no brainer for me. For this type of blog at least. I find that there is a real sense of community within the Blogger network and I think the blogs looks so pretty. When I was researching exaclty how to blog (all those years ago now!) I was thrilled to find that you must go with Wordpress to be able to make a living from your blog. Not so. Just yesterday while watching the local South East news, my lovely Jasmine and I were excited and delighted to see our lovely Zoella on the TV actually speaking about blog and vlog (using Blogger and Youtube - both 'free' platforms). She is working full time and making a lovely living that most people of her age could only dream of. Not that this comes easy. Using blogs and vlogs to make a living takes dedication and effort and I take my hat off to those who do it full time. Although I'm so sure there are so many rewarding aspects of the job too. Did you ever think about starting a blog? Any idea what you might want to write about? Start by making a bit of a plan then get out and get writing. If you were concerned about your blog-making web designing skills then don't be. The blogger platform is more than easy to navigate around. Dream it big. Then take action. You can do it!